On this All Saints’ Sunday, a modified rerun, from three years ago. But, since God inspired the message in the first place, I’m hopeful that it will still speak to the primary question of this day: What is a saint? 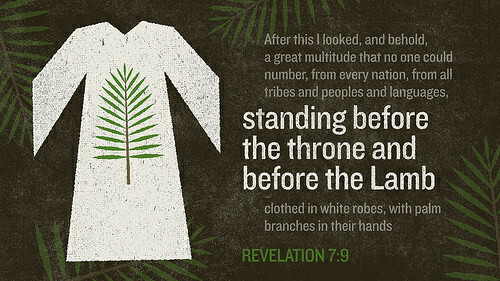 To find out, we’ll turn to today’s first lesson, Revelation 7:9-17. Revelation is based on a series of visions given to the apostle John about sixty years after Jesus’ resurrection. Beginning at chapter 6, John sees Jesus, the second Person of the one God, open the first six of seven seals. With the opening of each seal, John sees this old creation moving closer to its inevitable end. He also sees glimmers of the new creation that the risen and ascended Jesus will fully usher in at His second coming, when He returns to this world to claim His kingdom from our enemies: sin, death, and the devil. Jesus’ return will bring celebration and relief to all who have turned from sin and who have believed in Christ. But, as the last verse of Revelation 6 points out, the return of Jesus won’t be universally welcomed, any more than He or His people are universally welcomed today. Then, just before the opening of the seventh and final seal, John is allowed to see two scenes which he records in Revelation, chapter 7. Then the numbers of those sealed for salvation are counted out. The total comes to 144,000. Now, the Bible is not saying that just 144,000 people out of all human history will be part of God’s eternal kingdom! The number 144 is derived from multiplying the 12 tribes of Israel times the 12 apostles Jesus chose to lead the post-resurrection church. For John, it would have been a number implying perfection and completeness. And, tacking three zeroes onto the back of 144, making it 144,000, would be a bit like one of us talking about “a gazillion” people showing up at yesterday's women's retreat or for the Black Friday sales at Macy’s or Target. 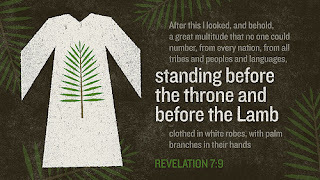 Then comes Revelation 7:9, where John writes, “After this I looked, and there before me was a great multitude that no one could count…” This is no little crowd of 144,000! It’s a multitude! It’s a crowds so big that “no one could count” it! I find this incredibly moving because on a starlit night 4000 years ago, an elderly man to whom God had promised the impossible struggled to believe that God could overcome decay and death to give him a son and a future to his descendants. The man’s name at the time was Abram. (Later to be changed by God to Abraham, a name that means “father of nations.”) To Abram, the promise seemed too good to be true. So, God reassured Abram in Genesis 15:5: “[God took Abram] outside and said, ‘Look up at the sky and count the stars—if indeed you can count them.’ Then he said to him, ‘So shall your offspring be.’” “I will give you a son, Abram,” God was saying. “And not only that, your descendants will dwarf the numbers of stars in the sky." The multitude from every nation that John is shown in His vision of heaven after the life of this old world has come to an end are the descendants of Abram, the very descendants God had promised on that starry night so long ago. They were, in the words of John in his gospel: “children born not of natural descent, nor of human decision or a husband’s will, but born of God” (John 1:13). This multitude comes to be numbered among Abraham’s descendants not by genetics, but by faith in the God Who ultimately revealed Himself to Jews and Gentiles in the person of Jesus Christ. Jesus says in John 14:9: “Anyone who has seen me has seen the Father.” The Father, God the Father, the same one Who made Abraham and Sarah the ancestors of nations, not because their bodies were capable of making children, but because God’s Holy Spirit, by the grace of God, can make new life in all who turn from sin and entrust themselves to Jesus. Jesus, God the Son, is the God Who gave Abraham that promise four millennia ago. And He is the God Who promises that all who turn from sin and believes in Him become descendants of Abraham. They are saints. We are the saints! God has always wanted to rescue His fallen, dead children from sin and death and to give them life. And His plan has always been the same: to give eternal life in His new creation to all who will trust, not in their own achievements, smarts, money, shrewdness, health, or anything else, but who trust only in Him. Saints are those who trust God to give them the free gifts that come to all who follow Jesus: gifts like forgiveness of sin, eternal life, and the power to live each day for His purposes. But if sainthood is a free gift from God, we must not think for a moment that sainthood is easy. Now, despite the propaganda the comes from those who misconstrue Revelation, "the great tribulation" does not refer to some endtime cataclysm. The great tribulation s the common experience through which every believer in Jesus goes in this life. Life in this world is the great tribulation. We live in a world filled with beauty and wonder. But with its beauty and wonder marred by human sin, death, and even the suffering of the saints, this world, at its best, can still only give us nothing more than a glimmer of the beauty and wonder—the perfection—that await all who persevere in following Jesus as their only God and King to the end. After completing life in this world, the saints who have kept on trusting Jesus, will be met by the Savior, Who will make them clean forever, Who will dry their tears, Who will feed their hunger and quench their thirst for the righteous life that only He can give, and He will welcome them into the new creation for which each of us were made. For now, we live in an in-between time in which, as Paul writes Romans 8, both we and the whole of creation wait with eager longing for Christ to reveal Himself and His children. But the truth is that life in this world is hard. Even in the best of times, life can be a struggle. And sometimes, our struggles are made even harder because we believe in Jesus Christ. How much easier the lives of Christians would be if we just went along with the world instead of rooting ourselves in the truth and grace of God revealed in His Word. Of course, along with that ease would come death, because life is only found in Christ! The devil tests, tempts, and tries the saints. And every believer in Christ will, eventually, bear the scars—physical, emotional, or relational—that come to those who put following Jesus first in their lives. Mark it well: Follow Christ and He will most certainly thwart you in some of your most heartfelt desires because He’s less interested in giving you momentary happiness than He is in fitting and forging you and your character for eternal life with Him. In this life, we’ve all been there...or will be. Our own personal “great ordeals” may include persecution, chronic or fatal illness, disagreements over priorities with those we love or with whom we work, or the conflicts that happen within us when a sin tantalizes us and we know that we must choose God’s way and not our own. Saints are people who trust their whole lives to Jesus. Sometimes haltingly. Always imperfectly. At times, speaking for myself anyway, resentfully. Always buttressed by daily repentance and renewal. But no matter how saints’ hearts may wander, they always know to come back to Christ. They know to Whom they belong and they know where they’re headed. They know that this life is not perfect. But they have a purpose in this life: To live for and to let the whole world know about the Lamb Jesus, Who will, after the last page has been closed in the last chapter of this world's story, welcome all who have trusted in Him to His new creation. In the meantime, dear saints of God, trust in Jesus. Know His love for you even in the midst of life’s greatest tribulations and know for a fact that, if you remain steadfast in following Jesus, like saints before us, you will be in Jesus' everlasting kingdom. If we remain faithful to Christ, you and I will one day join our fellow saints, along with God’s messengers, the angels, in singing and savoring the glories of our loving God and all who have persistently, perseveringly, enduringly followed their Savior in this world will hear the Lord say to us in the next world, “Come, you who are blessed by my Father; take your inheritance, the kingdom prepared for you since the creation of the world.” (Matthew 25:34) Amen!